A Democrat candidate running against a Senate incumbent is offered a job by the White House as an incentive to drop out of the primary race. Sounds like the Joe Sestak scandal in which he alleged that someone in the White House offered him a job in order to drop out of the race against the incumbent senator from Pennsylvania, Arlen Specter. Right? Well, yes. 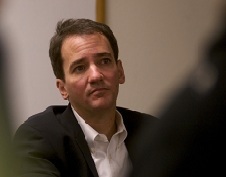 However, this also perfectly describes another similar scandal in which it is alleged that the White House offered a job to Andrew Romanoff (photo) in order to drop out of the primary race for the senate from Colorado against incumbent Michael Bennet. And the amazing thing about this scandal is that the newspaper that broke it has since remained completely silent on any further reporting. WASHINGTON — Not long after news leaked last month that Andrew Romanoff was determined to make a Democratic primary run against Sen. Michael Bennet, Romanoff received an unexpected communication from one of the most powerful men in Washington. Jim Messina, President Barack Obama's deputy chief of staff and a storied fixer in the White House political shop, suggested a place for Romanoff might be found in the administration and offered specific suggestions, according to several sources who described the communication to The Denver Post. Romanoff turned down the overture, which included mention of a job at USAID, the foreign aid agency, sources said. The White House said that no job was ever offered to Romanoff and that it would be wrong to suggest administration officials tried to buy him out of the contest. "Mr. Romanoff was never offered a position within the administration," said White House spokesman Adam Abrams. Yet several top Colorado Democrats described Messina's outreach to Romanoff to The Post, including the discussion of specific jobs in the administration. They asked for anonymity because of the sensitivity of the subject. When are you going to drop these fluff stories and write a series on the job offer that Romanoff got from the White House to get out of the race. This dog and pony Work comp fluff is junior reporter stuff for the wet behind the ears office girl who gets hired for her attributes. That is unless your editor has put the topic OFF limits. Good question. Has the Denver Post put the Romanoff White House job offer scandal off limits?